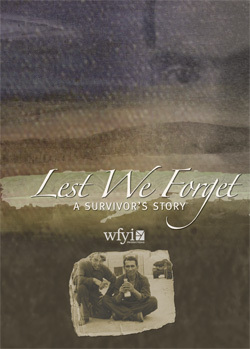 Lest We Forget is a personal recollection of World War II from the unique perspective of Columbus, Indiana resident Gustav Potthorf, a survivor of the Japanese slave labor camp that was responsible for the building of the notorious Bridge over the River Kawai. The now infamous bridge was built by prisoners of war to cross the river as part of what became known as the Thai-Burma "Death Railway." Over 100,000 POW's would ultimately lose their lives building the railway. They worked under horrific conditions with many of them buried where they fell. Gus kept most of those nightmarish experiences to himself, until he retired. As an outlet, he used art to convey his memories as a POW. He now has made several journeys back to Thailand to visit the site of the POW camp, and has become an important exponent for remembering the atrocities that occurred there.